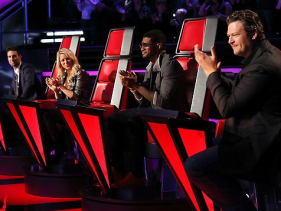 Contestants came swingin' Tuesday night as the second round of knockouts continued on "The Voice." Blake Shelton and Usher's teams were next on the chopping block, and unlike Monday night, there were a lot more surprise winners. Miley Cyrus put it best in her country ballad and Justin Rivers proved it when he faced off against one of Blake's favorites, Savannah Berry, for the first knockout of the night. Although Blake was hoping to find his "own Justin Bieber in Savannah," she was outperformed by Rivers, whom Levine called the "biggest surprise." Despite facing pressure for taking on a female song, Rivers' uphill battle paid off when he was announced the winner. You'd never have been able to guess it was Danielle Bradbery's third time performing ... ever. The natural-born singer let "Jesus Take the Wheel" as she channeled Carrie Underwood in her battle against Taylor Beckham. "You didn't seem confident," Levine told Beckham after a pitchy performance of Rihanna's "Russian Roulette." The opposite was true for Bradbery, who was commended by Usher for completely taking control and won the knockout. They say, "Dance like no one's watching," but did you ever hear, "Sing like you won the lottery?" Probably not, but that's exactly what Michelle Chamuel did when she performed Pink's "Raise Your Glass," and it worked. Besides challenging Usher to push-ups in rehearsals to build her stamina, a highly charismatic Chamuel basically pummeled Audrey Karrasch's pitchy and flat "How to Love" performance. "There's something about you I want to see more of," Levine said. And we agree — awkward and charming, Chameul won many-a hearts last night. She's Cathia and she's on fire. Booted from Team Shakira and stolen by Usher, Cathia had a lot to prove. The powerful Latina belted "Mr" Know It All" for her first English performance on television, blowing away the coaches and her contender, former frontrunner Ryan Innes. "I didn't hear the richness I usually hear," Levine said to Innes who pushed so hard that he lost his voice at the end. The decision was a "toughie," as Shakira put it because while Cathia had a stand-out moment, Innes had been consistent through the competition. Eventually, Usher chose Cathia, sending a deflated Innes home. Bromance took a turn when conversation stirred over ousted contestant C.Perkins' name, leaving Levine in a good position to point out Blake Shelton's first and last name spell "B-S."
All four coaches are now armed and ready with their top four picks for the live rounds next week, with Levine sporting an all-girls team, Shelton keeping it all-country, Shakira mixing and matching, and Usher fighting alongside the underdogs.